Following their respective second and ninth-place finishes in the Grade I Pegasus World Cup, Seeking the Soul and Tom’s d’Etat returned to their home winter base at Fair Grounds Race Course & Slots on Monday and will likely go down different paths for their next start. Owned by Charles Fipke, the 6-year-old son of Perfect Soul (Ire.) was bumped at the start, sat well off of the pace and weaved his way through traffic at the top of the stretch to get second. 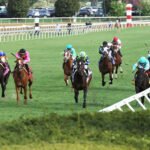 He earned a $1.25 million paycheck from his run in North America’s richest race on Saturday, which enhanced his total career earnings to $2,951,042. Prior to the Pegasus World Cup, Seeking the Soul was third behind Leofric in the Grade I Clark Handicap at Churchill Downs in November, a race which he won in 2017. He was fifth in last year’s edition of the Pegasus World Cup. 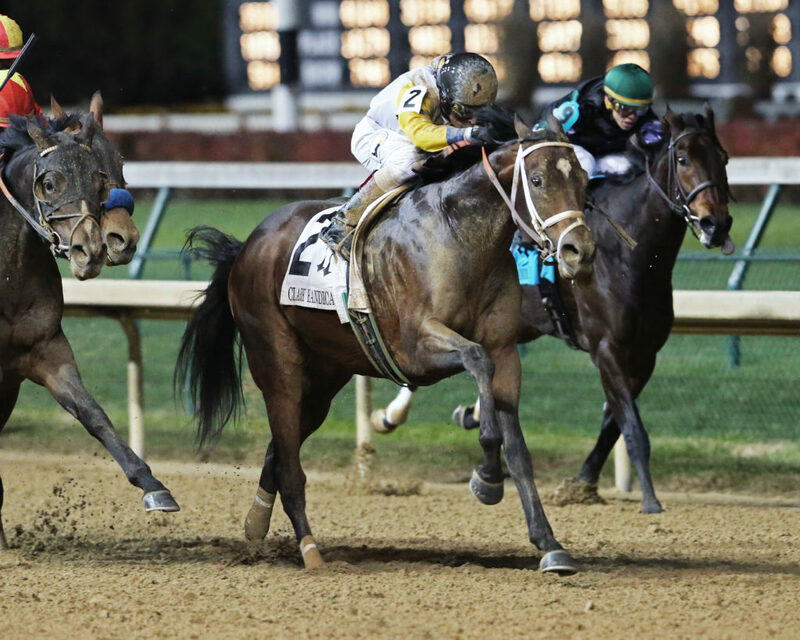 While Seeking the Soul is taking his show on the road for his next start, G M B Racing’s Tom’s d’Etat will likely race out of his own stall for his next start and is targeting the Grade II $400,000 New Orleans Handicap on March 23. Tom’s d’Etat was bred in Kentucky by SF Racing and is out of the graded stakes placed Giant’s Causeway broodmare Julia Tuttle, whose dam Candy Cane (Arg.) is a full sister to Grade I winner and multiple champion producing stallion Candy Ride (Arg.). He was purchased for $330,000 at the Keeneland September Yearling Sale in 2014 from the consignment barn of Hunter Valley Farm. Pin Oak Stable’s four-time graded stakes winner Synchrony continued to work toward his 6-year-old debut when working six furlongs in 1:14.00 flat over a fast Fair Grounds main track on Monday morning under jockey Declan Carroll. 3/24/2018. 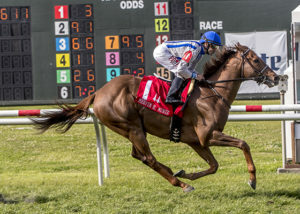 – Synchrony with Joe Bravo aboard wis the 26th running of the Muniz Memorial Handicap at Fair Grounds. Hodges Photography / Lou Hodges, Jr. Trained by Michael Stidham, the son of Tapit is working towards a repeat win in the Grade III $150,000 Fair Grounds Handicap on February 16. Stidham went on to say that Joe Bravo would return to Fair Grounds to ride Synchrony in the Fair Grounds Handicap. 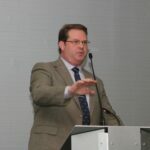 Synchrony’s foursome of graded stakes wins took place in last year’s Fair Grounds Handicap, the Grade II Muniz Memorial Stakes over the Stall-Wilson Turf Course as well as Monmouth Park’s Oceanport Stakes and Red Bank Stakes – both of which are Grade III events. He has not raced since a troubled third in the Grade II Seabiscuit Handicap at Del Mar last November. 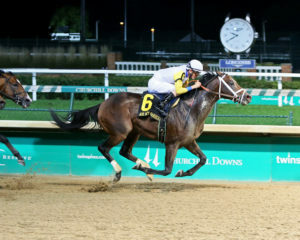 A Kentucky homebred, Synchrony is out of the eight-time stakes winning broodmare Brownie Points whose winning ways were displayed on both dirt and turf. Also making appearances on the Monday work tab were last year’s Grade II Fair Grounds Oaks winner Chocolate Martini, who recorded her first breeze of the year with a half-mile work in 49.00 for trainer Tom Amoss and owners Nine Thirty Racing and Double Doors Racing. 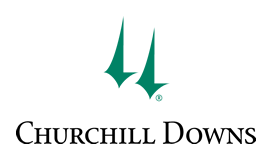 Lothenbach Stable’s Bell’s the One covered four furlongs in 48.60 for trainer Neil Pessin in preparation for the Grade II $200,000 Rachel Alexandra Stakes on February 16. Grade I-placed and Grade II Eight Belles Stakes winner Mia Mischief recorded her first breeze as a 4-year-old and went a half-mile in 51.40 for Hall of Fame trainer Steve Asmussen. She is owned by Bill and Corrine Heldigbrodt, Heider Family Stables and Madaket Stables.